Giant cell arteritis (GCA), or temporal arteritis, is a systemic inflammatory vasculitis of unknown etiology that occurs in older persons and can result in a wide variety of systemic, neurologic, and ophthalmologic complications. GCA is the most common form of systemic vasculitis in adults. Other names for GCA include arteritis cranialis, Horton disease, granulomatous arteritis, and arteritis of the aged. GCA should always be considered in the differential diagnosis of a new-onset headache in patients 50 years of age or older with an elevated erythrocyte sedimentation rate. Temporal artery biopsy remains the criterion standard for diagnosis of this granulomatous vasculitis (see the image below). However, increasing evidence supports the use of imaging studies for diagnosis in patients at high clinical risk. Hematoxylin- and eosin-stained superficial temporal artery biopsy specimen, cross section. The hallmark histologic features of GCA shown here include intimal thickening with luminal stenosis, mononuclear inflammatory cell infiltrate with media invasion and necrosis, and giant cell formation in the media. Visual loss is one of the most significant causes of morbidity in GCA. Permanent visual impairment may occur in as many as 20% of patients, and, in some cases, GCA can cause bilateral blindness. Newly recognized GCA should be considered a true neuro-ophthalmic emergency. Giant cell arteritis (GCA) is primarily a disease of cell-mediated immunity, which is thought to arise as a maladaptive response to endothelial injury. Actinic damage to the temporal artery from chronic sun exposure has been proposed as one source of the injury. The adventitia is the likely site of initial immunologic injury and is considered the immunological center of the disorder, while the intima and media are the histological center. The primary inflammatory response involves the activation of dendritic cells in the adventitia of arteries by an unknown antigen, with production of chemokines that recruit CD4+T helper cells. Activated CD4+ T helper cells polarize into Th1 cells (producing interferon gamma) and Th17 cells (producing interleukin 17). Systemic manifestations are likely related to the inflammatory process and cytokine elaboration. End-organ involvement relates to hyperplasia and occlusion of the arteries serving those organs. 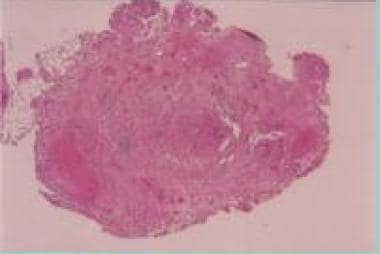 Concentric intimal hyperplasia is an important underlying pathologic lesion in GCA. Intimal hyperplasia presumably occurs as a repair mechanism in response to injury of the blood vessel wall. Platelet-derived growth factor (PDGF) is important in stimulating intimal hyperplasia. In GCA, PDGF derives from macrophages and giant cells, and this distinguishes GCA from other vasculopathies. In atherosclerotic disease, for example, PDGF is produced mostly by resident smooth muscle cells rather than monocytes. Cell adhesion molecules influence the pathogenesis, and endothelial cells play a pivotal role. Inflammation is an important process that influences the endothelium and causes neovascularization. This process occurs mainly at the intima-media junction and at the adventitial layer. A cellular immune reaction to elastin has been implicated in the pathogenesis of GCA. In support of the hypothesis that elastin is the inciting antigen, disease severity has been shown to correlate with the amount of elastic tissue within the vessels. For example, intracranial arteries lack an internal elastic lamina, and GCA does not cause a widespread intracranial cerebral vasculitis. This hypothesis also is supported by histopathologic findings of a disrupted, fragmented internal elastic lamina in affected vessels and the presence of characteristic giant cells, which may contain elastic fiber fragments, close to the internal elastic lamina. Along with elevated serum levels of neutrophil elastase, deposition of elastase along the damaged internal elastic lamina has been described. A close relationship exists between GCA and polymyalgia rheumatica. [20, 21, 131] About 50% of patients with GCA have underlying polymyalgia rheumatica, and about 15% of individuals with polymyalgia rheumatica develop GCA. The precise nature of this association is poorly understood. Several authors have suggested that these 2 diseases are actually different stages of the same disease process. The exact etiology of giant cell arteritis (GCA) remains unknown. Despite increased understanding of the inflammatory cascade responsible for the disease process, the initial event that triggers the cascade remains uncertain. Genetic, environmental, and autoimmune factors have been identified. Epidemiological observations, reports, and studies using DNA detection techniques have implicated Chlamydia pneumoniae, Mycoplasma pneumoniae, parvovirus B19, and varicella zoster as the impetus for the destructive inflammation. [24, 25, 26] Nevertheless, it is generally accepted that these infectious agents are only "innocent bystanders." The immune system (both cellular and humoral) has been implicated in the pathogenesis of GCA. The granulomatous histopathology of GCA has suggested the presence of an antigen-driven disease with local T-cell and macrophage activation in or near elastic tissue in the arterial walls with an important role of the proinflammatory cytokines. [27, 28] It may begin as a foreign body giant cell attack on calcified internal elastic membrane in the arteries and on calcified atrophic parts of the aortic media. The reported incidence of GCA ranges from approximately 0.5 to 27 cases per 100,000 people aged 50 years or older. The annual incidence is higher in northern areas of the United States. The prevalence of GCA depends heavily on the number of individuals aged 50 years or older; the mean age of onset is 75 years. Countries with a lower life expectancy have a lower prevalence. The annual incidence in northern European countries has been reported to be more than 20 cases per 100,000 people over the age of 50 years. A United Kingdom study reported an incidence of 22 per 100,000 in that age group. Scandinavian countries report the highest incidence of GCA—up to 32.4 per 100,000 individuals over the age of 50 years. The annual incidence in southern European countries has been reported to be less than 12 cases per 100,000 people. In Lugo, Spain, the average annual incidence for the population aged 50 years and older was 10 cases per 100,000 people. Although existing epidemiologic studies are limited because they have been performed on predominantly white populations, the results of these studies suggest that GCA primarily affects whites, specifically those of northern European descent. Scandinavians have the highest prevalence. GCA is less common in African Americans and Asians. Although GCA had been considered less common among Hispanic persons,  recent evidence has challenged this notion. The female-to-male ratio in GCA is roughly 3.7:1. Smoking increases the risk 6-fold in women. Age is the most important risk factor for GCA. The disease is rare in patients younger than 50 years. In those 50 years and older, the incidence increases with age, peaking in the seventh to eighth decade. The age range in one series of 166 biopsy-proven cases was 55-92 years. The median age of onset is 75 years. GCA is the most common systemic vasculitis affecting elderly patients. With prompt, adequate therapy, full recovery is the rule. Symptoms from temporal arteritis improve within days of treatment. Corticosteroids can usually be tapered within the first 4-6 weeks and eventually discontinued. The reduced rate of neuro-ophthalmologic complications in recent years reflects improved recognition and treatment; blindness is now a rare complication. Although the overall course of the disease is one of progressive improvement and eventual complete resolution, the clinical course is highly variable. The average duration of treatment is 2 years; however, some patients require treatment for 5 years or more. [15, 11] Morbidity from steroid therapy can be worse than that from the underlying disease, with the exception of blindness. Rarely, patients do not respond to steroid therapy or doses cannot be tapered. Cytotoxic or immunosuppressive drugs have been recommended in such cases, but more data are needed. The prognosis for patients with untreated GCA is extremely poor. These patients may suffer blindness, or death from myocardial infarction, stroke, or dissecting aortic aneurysm. Ophthalmic complications are common and include visual disturbances, amaurosis fugax, diplopia, and blindness from involvement of the ophthalmic artery. Visual loss in GCA is often irreversible, but may be temporary; may be partial or complete; and may involve one or both eyes. Blindness usually occurs abruptly and painlessly. Ischemic optic neuropathy with eventual optic atrophy is the most common cause of visual loss and occurs in 15% of patients. GCA leads to death by stroke or MI in roughly 2% of cases. As would be expected, the topographic extent and severity of the vasculitis is greater in fatal than in nonfatal cases. More difficult to quantify are the number of patients whose deaths are related directly or indirectly to chronic corticosteroid use and its attendant complications (eg, hip fracture). The inflammatory process may weaken the aortic wall, leading to localized aneurysm formation, aortic annular dilatation, and aortic regurgitation. Narrowing or occlusion of the branch vessels of the thoracic aorta (clinically referred to as aortic arch syndrome) may be found in 9-14% of cases, producing symptoms similar to those of Takayasu arteritis (decreased upper extremity pulses and blood pressure, arm or leg claudication, Raynaud phenomenon, transient ischemic attacks, coronary ischemia, and abdominal angina). Evans and colleagues reported aortic aneurysms occurring in 15% of patients at a median of 6 years after the initial diagnosis of GCA. Two thirds were thoracic aortic aneurysms, with the majority located in the ascending aorta. Almost 33% of patients developed symptomatic aortic regurgitation. Approximately 50% of patients with thoracic aortic aneurysms died suddenly from aortic dissection. In very rare cases, GCA involves the central nervous system (CNS), producing abnormal mental status, seizures, or strokes. This is despite the fact that GCA for the most part affects only vessels with an elastica, which intradural blood vessels do not have. However, involvement of the aortic arch vessels, including the subclavian arteries, can lead to subclavian steal syndrome and brain ischemia. Peripheral nerve involvement is rare in GCA. For unknown reasons, renal involvement is also rare. Education is the most important step in helping the patient appreciate the clinical facets of this illness, the potential adverse effects of the therapy, and the need for monitoring. Patients who experienced visual loss prior to the initiation of therapy should be cautioned that despite therapy, the lost vision may not be regained. Patients must be instructed about the risk of complications and symptomatic relapses. Advise patients to immediately consult a physician if they experience symptoms of transient blurring of vision because of the possibility of impending attacks of GCA or transient ischemic attack. Patients must understand the importance of strictly adhering to their steroid dose schedule and the possible need for ancillary interventions, such as dietary restrictions, to reduce the incidence of steroid-related adverse effects. To avoid misunderstandings, inform patients and their families about vertebral compression fracture and other potential complications of steroid therapy that can occur even with proper therapy. Patients should be informed that they carry a lifelong risk for the development of large-vessel disease, particularly aortic aneurysms. The need for long-term followup should be stressed. For patient education information, see Temporal Arteritis, as well as the Eye and Vision Center and Headache and Migraine Center. Hoffman GS. Giant Cell Arteritis. Ann Intern Med. 2016 Nov 1. 165 (9):ITC65-ITC80. [Medline]. Waldman CW, Waldman SD, Waldman RA. Giant cell arteritis. Med Clin North Am. 2013 Mar. 97(2):329-35. [Medline]. Cantini F, Niccoli L, Storri L, Nannini C, Olivieri I, Padula A, et al. Are polymyalgia rheumatica and giant cell arteritis the same disease?. Semin Arthritis Rheum. 2004 Apr. 33(5):294-301. [Medline]. Dejaco C, Duftner C, Buttgereit F, Matteson EL, Dasgupta B. The spectrum of giant cell arteritis and polymyalgia rheumatica: revisiting the concept of the disease. Rheumatology (Oxford). 2016 Aug 1. [Medline]. Liozon E, Ly KH, Robert PY. [Ocular complications of giant cell arteritis]. Rev Med Interne. 2013 Jul. 34(7):421-30. [Medline]. Birkhead NC, Wagener HP, Shick RM. Treatment of temporal arteritis with adrenal corticosteroids: Results in 55 cases in which the lesion was proved at biopsy. JAMA. 1975. 163:821. Diaz VA, DeBroff BM, Sinard J. Comparison of histopathologic features, clinical symptoms, and erythrocyte sedimentation rates in biopsy-positive temporal arteritis. Ophthalmology. 2005 Jul. 112(7):1293-8. [Medline]. Rodríguez-Pla A, Bosch-Gil JA, Rosselló-Urgell J, Huguet-Redecilla P, Stone JH, Vilardell-Tarres M. Metalloproteinase-2 and -9 in giant cell arteritis: involvement in vascular remodeling. Circulation. 2005 Jul 12. 112(2):264-9. [Medline]. Eberhardt RT, Dhadly M. Giant cell arteritis: diagnosis, management, and cardiovascular implications. Cardiol Rev. 2007 Mar-Apr. 15(2):55-61. [Medline]. Cid MC, Cebrián M, Font C, Coll-Vinent B, Hernández-Rodríguez J, Esparza J, et al. Cell adhesion molecules in the development of inflammatory infiltrates in giant cell arteritis: inflammation-induced angiogenesis as the preferential site of leukocyte-endothelial cell interactions. Arthritis Rheum. 2000 Jan. 43(1):184-94. [Medline]. Maugeri N, Baldini M, Rovere-Querini P, Maseri A, Sabbadini MG, Manfredi AA. Leukocyte and platelet activation in patients with giant cell arteritis and polymyalgia rheumatica: a clue to thromboembolic risks?. Autoimmunity. 2009 May. 42(4):386-8. [Medline]. Goodwin JS. Progress in gerontology: polymyalgia rheumatica and temporal arteritis. J Am Geriatr Soc. 1992 May. 40(5):515-25. [Medline]. Borchers AT, Gershwin ME. Giant cell arteritis: a review of classification, pathophysiology, geoepidemiology and treatment. Autoimmun Rev. 2012 May. 11(6-7):A544-54. [Medline]. Wilkinson IM, Russell RW. Arteries of the head and neck in giant cell arteritis. A pathological study to show the pattern of arterial involvement. Arch Neurol. 1972 Nov. 27(5):378-91. [Medline]. Scola CJ, Li C, Upchurch KS. Mesenteric involvement in giant cell arteritis. An underrecognized complication? Analysis of a case series with clinicoanatomic correlation. Medicine (Baltimore). 2008 Jan. 87(1):45-51. [Medline]. Kermani TA, Warrington KJ. Lower extremity vasculitis in polymyalgia rheumatica and giant cell arteritis. Curr Opin Rheumatol. 2011 Jan. 23(1):38-42. [Medline]. [Full Text]. Salvarani C, Pipitone N, Boiardi L, Hunder GG. Do we need treatment with tumour necrosis factor blockers for giant cell arteritis?. Ann Rheum Dis. 2008 May. 67(5):577-9. [Medline]. Caylor TL, Perkins A. Recognition and management of polymyalgia rheumatica and giant cell arteritis. Am Fam Physician. 2013 Nov 15. 88 (10):676-84. [Medline]. [Full Text]. Salvarani C, Cantini F, Hunder GG. Polymyalgia rheumatica and giant-cell arteritis. Lancet. 2008 Jul 19. 372(9634):234-45. [Medline]. Liozon E, Ouattara B, Rhaiem K, Ly K, Bezanahary H, Loustaud V, et al. Familial aggregation in giant cell arteritis and polymyalgia rheumatica: a comprehensive literature review including 4 new families. Clin Exp Rheumatol. 2009 Jan-Feb. 27(1 Suppl 52):S89-94. [Medline]. Palomino-Morales R, Torres O, Vazquez-Rodriguez TR, Morado IC, Castañeda S, Callejas-Rubio JL, et al. Association between toll-like receptor 4 gene polymorphism and biopsy-proven giant cell arteritis. J Rheumatol. 2009 Jul. 36(7):1501-6. [Medline]. Alvarez-Lafuente R, Fernández-Gutiérrez B, Jover JA, Júdez E, Loza E, Clemente D, et al. Human parvovirus B19, varicella zoster virus, and human herpes virus 6 in temporal artery biopsy specimens of patients with giant cell arteritis: analysis with quantitative real time polymerase chain reaction. Ann Rheum Dis. 2005 May. 64(5):780-2. [Medline]. [Full Text]. Russo MG, Waxman J, Abdoh AA, Serebro LH. Correlation between infection and the onset of the giant cell (temporal) arteritis syndrome. A trigger mechanism?. Arthritis Rheum. 1995 Mar. 38(3):374-80. [Medline]. Gilden D, Nagel M. Varicella Zoster Virus in Temporal Arteries of Patients With Giant Cell Arteritis. J Infect Dis. 2015 Jul 15. 212 Suppl 1:S37-9. [Medline]. [Full Text]. Pache M, Kaiser HJ, Haufschild T, Lübeck P, Flammer J. Increased endothelin-1 plasma levels in giant cell arteritis: a report on four patients. Am J Ophthalmol. 2002 Jan. 133(1):160-2. [Medline]. Patel SJ, Lundy DC. Ocular manifestations of autoimmune disease. Am Fam Physician. 2002 Sep 15. 66(6):991-8. [Medline]. Salvarani C, Gabriel SE, O'Fallon WM, Hunder GG. The incidence of giant cell arteritis in Olmsted County, Minnesota: apparent fluctuations in a cyclic pattern. Ann Intern Med. 1995 Aug 1. 123(3):192-4. [Medline]. Smeeth L, Cook C, Hall AJ. Incidence of diagnosed polymyalgia rheumatica and temporal arteritis in the United Kingdom, 1990-2001. Ann Rheum Dis. 2006 Aug. 65(8):1093-8. [Medline]. [Full Text]. Ramstead CL, Patel AD. Giant cell arteritis in a neuro-ophthalmology clinic in Saskatoon, 1998-2003. Can J Ophthalmol. 2007 Apr. 42(2):295-8. [Medline]. Ostberg G. Temporal arteritis in a large necropsy series. Ann Rheum Dis. 1971 May. 30(3):224-35. [Medline]. [Full Text]. Bosley TM, Riley FC. Giant cell arteritis in Saudi Arabia. Int Ophthalmol. 1998. 22(1):59-60. [Medline]. Artal NM, Rodriguez M, Luna JD, Reviglio VE, Cuello O, Muiñ JC, et al. Giant cell arteritis in a Hispanic population. Ophthalmology. 2002 Oct. 109(10):1757; discussion 1757. [Medline]. Liu NH, LaBree LD, Feldon SE, Rao NA. The epidemiology of giant cell arteritis : a 12-year retrospective study. Ophthalmology. 2001 Jun. 108(6):1145-9. [Medline]. Restuccia G, Boiardi L, Cavazza A, Catanoso M, Macchioni P, Muratore F, et al. Long-term remission in biopsy proven giant cell arteritis: A retrospective cohort study. J Autoimmun. 2016 Oct 11. [Medline]. Narváez J, Nolla-Solé JM, Clavaguera MT, Valverde-García J, Roig-Escofet D. Longterm therapy in polymyalgia rheumatica: effect of coexistent temporal arteritis. J Rheumatol. 1999 Sep. 26(9):1945-52. [Medline]. Foroozan R, Deramo VA, Buono LM, Jayamanne DG, Sergott RC, Danesh-Meyer H, et al. Recovery of visual function in patients with biopsy-proven giant cell arteritis. Ophthalmology. 2003 Mar. 110(3):539-42. [Medline]. González-Gay MA, García-Porrúa C, Llorca J, Hajeer AH, Brañas F, Dababneh A, et al. Visual manifestations of giant cell arteritis. Trends and clinical spectrum in 161 patients. Medicine (Baltimore). 2000 Sep. 79(5):283-92. [Medline]. Scheurer RA, Harrison AR, Lee MS. Treatment of vision loss in giant cell arteritis. Curr Treat Options Neurol. 2012 Feb. 14(1):84-92. [Medline]. Danesh-Meyer H, Savino PJ, Gamble GG. Poor prognosis of visual outcome after visual loss from giant cell arteritis. Ophthalmology. 2005 Jun. 112(6):1098-103. [Medline]. Hayreh SS, Zimmerman B. Visual deterioration in giant cell arteritis patients while on high doses of corticosteroid therapy. Ophthalmology. 2003 Jun. 110(6):1204-15. [Medline]. Loddenkemper T, Sharma P, Katzan I, Plant GT. Risk factors for early visual deterioration in temporal arteritis. J Neurol Neurosurg Psychiatry. 2007 Nov. 78(11):1255-9. [Medline]. [Full Text]. Solans-Laqué R, Bosch-Gil JA, Molina-Catenario CA, Ortega-Aznar A, Alvarez-Sabin J, Vilardell-Tarres M. Stroke and multi-infarct dementia as presenting symptoms of giant cell arteritis: report of 7 cases and review of the literature. Medicine (Baltimore). 2008 Nov. 87(6):335-44. [Medline]. Taylor S, Lightman S. The eye in cardiac and cardiovascular disease. Hosp Med. 2003 May. 64(5):299-301. [Medline]. Smulders YM, Verhagen DW. Giant cell arteritis causing aortic dissection and acute hypertension. BMJ. 2008 Jul 4. 337:a426. [Medline]. Tomasson G, Peloquin C, Mohammad A, Love TJ, Zhang Y, Choi HK, et al. Risk for cardiovascular disease early and late after a diagnosis of giant-cell arteritis: a cohort study. Ann Intern Med. 2014 Jan 21. 160(2):73-80. [Medline]. Ninan J, Nguyen AM, Cole A, Rischmueller M, Dodd T, Roberts-Thomson P, et al. Mortality in patients with biopsy-proven giant cell arteritis: a south australian population-based study. J Rheumatol. 2011 Oct. 38(10):2215-7. [Medline]. Hunder GG, Bloch DA, Michel BA, Stevens MB, Arend WP, Calabrese LH, et al. The American College of Rheumatology 1990 criteria for the classification of giant cell arteritis. Arthritis Rheum. 1990 Aug. 33(8):1122-8. [Medline]. [Guideline] Dasgupta B, Borg FA, Hassan N, Alexander L, Barraclough K, Bourke B, et al. BSR and BHPR guidelines for the management of giant cell arteritis. Rheumatology (Oxford). 2010 Aug. 49 (8):1594-7. [Medline]. [Full Text]. Bhatti MT, Tabandeh H. Giant cell arteritis: diagnosis and management. Curr Opin Ophthalmol. 2001 Dec. 12(6):393-9. [Medline]. Kumar B, Toney DE, Alikhan M, Lohr KM. Giant cell arteritis presenting as depressed mood and headache in an elderly patient. J Clin Rheumatol. 2013 Oct. 19(7):405-6. [Medline]. Johnson H, Bouman W, Pinner G. Psychiatric aspects of temporal arteritis: a case report and review of the literature. J Geriatr Psychiatry Neurol. 1997 Oct. 10(4):142-5. [Medline]. Bhatti MT. Scalp necrosis and visual loss due to giant cell arteritis. J Emerg Med. 2001 Jul. 21(1):67-8. [Medline]. Adams WB, Becknell CA. Rare manifestation of scalp necrosis in temporal arteritis. Arch Dermatol. 2007 Aug. 143(8):1079-80. [Medline]. Tsianakas A, Ehrchen JM, Presser D, Fischer T, Kruse-Loesler B, Luger TA, et al. Scalp necrosis in giant cell arteritis: case report and review of the relevance of this cutaneous sign of large-vessel vasculitis. J Am Acad Dermatol. 2009 Oct. 61(4):701-6. [Medline]. Mucke T, Kesting MR, Holzle F, Wolff KD. Uncommon presentation of giant cell arteritis: report of two cases with scalp necrosis. Neurol India. 2009 Jan-Feb. 57(1):61-2. [Medline]. Goicochea M, Correale J, Bonamico L, Dominguez R, Bagg E, Famulari A, et al. Tongue necrosis in temporal arteritis. Headache. 2007 Sep. 47(8):1213-5. [Medline]. Brodmann M, Dorr A, Hafner F, Gary T, Pilger E. Tongue necrosis as first symptom of giant cell arteritis (GCA). Clin Rheumatol. 2009 Jun. 28 Suppl 1:S47-9. [Medline]. Nesher G, Nesher R, Rozenman Y, Sonnenblick M. Visual hallucinations in giant cell arteritis: association with visual loss. J Rheumatol. 2001 Sep. 28(9):2046-8. [Medline]. Amor-Dorado JC, Llorca J, Garcia-Porrua C, Costa C, Perez-Fernandez N, Gonzalez-Gay MA. Audiovestibular manifestations in giant cell arteritis: a prospective study. Medicine (Baltimore). 2003 Jan. 82(1):13-26. [Medline]. Rizzo J. Giant cell arteritis. Boston, Mass: Lecture presented at: Massachusetts Eye and Ear Infirmary; Spring 2000. Barbazan C, González-Gay MA, Aspe B, Fuciños L, Mantecon-Aparicio JM. Visual recovery after retinal stroke due to giant cell arteritis. Clin Exp Rheumatol. 2000 May-Jun. 18(3):425-6. [Medline]. Blodi CF. Value of ophthalmologic examination in diagnosing temporal arteritis. JAMA. 2002 Mar 27. 287(12):1528-9. [Medline]. Danesh-Meyer H, Savino PJ, Spaeth GL, Gamble GD. Comparison of arteritis and nonarteritic anterior ischemic optic neuropathies with the Heidelberg Retina Tomograph. Ophthalmology. 2005 Jun. 112(6):1104-12. [Medline]. Galasso JM, Jay WM. An occult case of giant cell arteritis presenting with combined anterior ischemic optic neuropathy and cilioretinal artery occlusion. Semin Ophthalmol. 2004 Sep-Dec. 19(3-4):75-7. [Medline]. Hayreh SS. Posterior ischaemic optic neuropathy: clinical features, pathogenesis, and management. Eye (Lond). 2004 Nov. 18(11):1188-206. [Medline]. Kim N, Trobe JD, Flint A, Keoleian G. Late ipsilateral recurrence of ischemic optic neuropathy in giant cell arteritis. J Neuroophthalmol. 2003 Jun. 23(2):122-6. [Medline]. Lessell S. Optic neuropathy in giant cell arteritis. J Neuroophthalmol. 2005 Sep. 25(3):247. [Medline]. McFadzean RM. Ischemic optic neuropathy and giant cell arteritis. Curr Opin Ophthalmol. 1998 Dec. 9(6):10-7. [Medline]. Rucker JC, Biousse V, Newman NJ. Ischemic optic neuropathies. Curr Opin Neurol. 2004 Feb. 17(1):27-35. [Medline]. Saha N, Rehman SU. Reversal of chronic ocular ischaemia with good visual recovery in giant cell arteritis. Eye (Lond). 2006 Jun. 20(6):742-3. [Medline]. Schäuble B, Wijman CA, Koleini B, Babikian VL. Ophthalmic artery microembolism in giant cell arteritis. J Neuroophthalmol. 2000 Dec. 20(4):273-5. [Medline]. Schmidt D. Ocular ichemia syndrome - a malignant course of giant cell arteritis. Eur J Med Res. 2005 Jun 22. 10(6):233-42. [Medline]. Tovilla-Canales JL. Ocular manifestations of giant cell arteritis. Curr Opin Ophthalmol. 1998 Dec. 9(6):73-9. [Medline]. Al-Abdulla NA, Kelley JS, Green WR, Miller NR. Herpes zoster vasculitis presenting as giant cell arteritis with choroidal infarction. Retina. 2003 Aug. 23(4):567-9. [Medline]. Casson RJ, Fleming FK, Shaikh A, James B. Bilateral ocular ischemic syndrome secondary to giant cell arteritis. Arch Ophthalmol. 2001 Feb. 119(2):306-7. [Medline]. Velusami P, Doherty M, Gnanaraj L. A case of occult giant cell arteritis presenting with bilateral cotton wool spots. Eye (Lond). 2006 Jul. 20(7):863-4. [Medline]. Wein FB, Miller NR. Unilateral central retinal artery occlusion followed by contralateral anterior ischemic optic neuropathy in giant cell arteritis. Retina. 2000. 20(3):301-3. [Medline]. Borg FA, Salter VL, Dasgupta B. Neuro-ophthalmic complications in giant cell arteritis. Curr Allergy Asthma Rep. 2008 Jul. 8(4):323-30. [Medline]. Killer HE, Holtz DJ, Kaiser HJ, Laeng RH. Diplopia, ptosis, and hepatitis as presenting signs and symptoms of giant cell arteritis. Br J Ophthalmol. 2000 Nov. 84(11):1319-20. [Medline]. [Full Text]. Ahmad I, Zaman M. Bilateral internuclear ophthalmoplegia: an initial presenting sign of giant cell arteritis. J Am Geriatr Soc. 1999 Jun. 47(6):734-6. [Medline]. Foroozan R, Buono LM, Savino PJ, Sergott RC. Tonic pupils from giant cell arteritis. Br J Ophthalmol. 2003 Apr. 87(4):510-2. [Medline]. [Full Text]. Maksimowicz-McKinnon K, Clark TM, Hoffman GS. Takayasu arteritis and giant cell arteritis: a spectrum within the same disease?. Medicine (Baltimore). 2009 Jul. 88(4):221-6. [Medline]. Audemard A, Boutemy J, Galateau-Salle F, Macro M, Bienvenu B. AL amyloidosis with temporal artery involvement simulates giant-cell arteritis. Joint Bone Spine. 2012 Mar. 79(2):195-7. [Medline]. Wise CM, Agudelo CA, Chmelewski WL, McKnight KM. Temporal arteritis with low erythrocyte sedimentation rate: a review of five cases. Arthritis Rheum. 1991 Dec. 34(12):1571-4. [Medline]. Salvarani C, Hunder GG. Giant cell arteritis with low erythrocyte sedimentation rate: frequency of occurence in a population-based study. Arthritis Rheum. 2001 Apr. 45(2):140-5. [Medline]. Hayreh SS, Podhajsky PA, Raman R, Zimmerman B. Giant cell arteritis: validity and reliability of various diagnostic criteria. Am J Ophthalmol. 1997 Mar. 123(3):285-96. [Medline]. Costello F, Zimmerman MB, Podhajsky PA, Hayreh SS. Role of thrombocytosis in diagnosis of giant cell arteritis and differentiation of arteritic from non-arteritic anterior ischemic optic neuropathy. Eur J Ophthalmol. 2004 May-Jun. 14(3):245-57. [Medline]. Parikh M, Miller NR, Lee AG, Savino PJ, Vacarezza MN, Cornblath W, et al. Prevalence of a normal C-reactive protein with an elevated erythrocyte sedimentation rate in biopsy-proven giant cell arteritis. Ophthalmology. 2006 Oct. 113(10):1842-5. [Medline]. van der Geest KS, Abdulahad WH, Rutgers A, Horst G, Bijzet J, Arends S, et al. Serum markers associated with disease activity in giant cell arteritis and polymyalgia rheumatica. Rheumatology (Oxford). 2015 Aug. 54 (8):1397-402. [Medline]. Gonzalez-Gay MA, Lopez-Diaz MJ, Barros S, Garcia-Porrua C, Sanchez-Andrade A, Paz-Carreira J, et al. Giant cell arteritis: laboratory tests at the time of diagnosis in a series of 240 patients. Medicine (Baltimore). 2005 Sep. 84(5):277-90. [Medline]. Walvick MD, Walvick MP. Giant cell arteritis: laboratory predictors of a positive temporal artery biopsy. Ophthalmology. 2011 Jun. 118(6):1201-4. [Medline]. Ellen H, Nusser J. Which clinical features and lab findings increase the likelihood of temporal arteritis?. The Journal of Family Practice. 2008. 57:119-120. Murgatroyd H, Nimmo M, Evans A, MacEwen C. The use of ultrasound as an aid in the diagnosis of giant cell arteritis: a pilot study comparing histological features with ultrasound findings. Eye (Lond). 2003 Apr. 17(3):415-9. [Medline]. Alberts MS, Mosen DM. Diagnosing temporal arteritis: duplex vs. biopsy. QJM. 2007 Dec. 100(12):785-9. [Medline]. Karahaliou M, Vaiopoulos G, Papaspyrou S, Kanakis MA, Revenas K, Sfikakis PP. Colour duplex sonography of temporal arteries before decision for biopsy: a prospective study in 55 patients with suspected giant cell arteritis. Arthritis Res Ther. 2006. 8(4):R116. [Medline]. [Full Text]. Ball EL, Walsh SR, Tang TY, Gohil R, Clarke JM. Role of ultrasonography in the diagnosis of temporal arteritis. Br J Surg. 2010 Dec. 97(12):1765-71. [Medline]. Charlton R. Optimal management of giant cell arteritis and polymyalgia rheumatica. Ther Clin Risk Manag. 2012. 8:173-9. [Medline]. [Full Text]. Diamantopoulos AP, Haugeberg G, Lindland A, Myklebust G. The fast-track ultrasound clinic for early diagnosis of giant cell arteritis significantly reduces permanent visual impairment: towards a more effective strategy to improve clinical outcome in giant cell arteritis?. Rheumatology (Oxford). 2016 Jan. 55 (1):66-70. [Medline]. Suelves AM, España-Gregori E, Tembl J, Rohrweck S, Millán JM, Díaz-Llopis M. Doppler ultrasound and giant cell arteritis. Clin Ophthalmol. 2010 Nov 25. 4:1383-4. [Medline]. [Full Text]. Bley TA, Reinhard M, Hauenstein C, Markl M, Warnatz K, Hetzel A, et al. Comparison of duplex sonography and high-resolution magnetic resonance imaging in the diagnosis of giant cell (temporal) arteritis. Arthritis Rheum. 2008 Aug. 58(8):2574-8. [Medline]. Koenigkam-Santos M, Sharma P, Kalb B, Oshinski JN, Weyand CM, Goronzy JJ, et al. Magnetic resonance angiography in extracranial giant cell arteritis. J Clin Rheumatol. 2011 Sep. 17(6):306-10. [Medline]. Ghinoi A, Pipitone N, Nicolini A, Boiardi L, Silingardi M, Germanò G, et al. Large-vessel involvement in recent-onset giant cell arteritis: a case-control colour-Doppler sonography study. Rheumatology (Oxford). 2012 Apr. 51(4):730-4. [Medline]. Brannan SO, Cheung D, Murray PI, Dewar C, Guest P. The use of magnetic resonance imaging in the diagnosis of suspected giant cell arteritis. Br J Ophthalmol. 2004 Dec. 88(12):1595-6. [Medline]. [Full Text]. Cockerham KP, Cockerham GC, Brown HG, Hidayat AA. Radiosensitive orbital inflammation associated with temporal arteritis. J Neuroophthalmol. 2003 Jun. 23(2):117-21. [Medline]. Garcia-Porrua C, Santamarina R, Armesto V, Gonzalez-Gay MA. Magnetic resonance imaging in optic neuritis due to giant cell arteritis. Arthritis Rheum. 2005 Apr 15. 53(2):313-4. [Medline]. Khoury JA, Hoxworth JM, Mazlumzadeh M, Wellik KE, Wingerchuk DM, Demaerschalk BM. The clinical utility of high resolution magnetic resonance imaging in the diagnosis of giant cell arteritis: a critically appraised topic. Neurologist. 2008 Sep. 14(5):330-5. [Medline]. Daumas A, Scafi M, Jean E, Andrianasolo M, Cammilleri S, Benyamine A, et al. Fluorine-18 Fluorodeoxyglucose Positron Emission Tomography Hypermetabolism of Vertebral Arteries Revealing Giant Cell Arteritis. Am J Med. 2015 Jul. 128 (7):e1-2. [Medline]. Niederkohr RD, Levin LA. A Bayesian analysis of the true sensitivity of a temporal artery biopsy. Invest Ophthalmol Vis Sci. 2007 Feb. 48(2):675-80. [Medline]. Pountain G, Hazleman B. ABC of rheumatology. Polymyalgia rheumatica and giant cell arteritis. BMJ. 1995 Apr 22. 310(6986):1057-9. [Medline]. [Full Text]. Ray-Chaudhuri N, Kiné DA, Tijani SO, Parums DV, Cartlidge N, Strong NP, et al. Effect of prior steroid treatment on temporal artery biopsy findings in giant cell arteritis. Br J Ophthalmol. 2002 May. 86(5):530-2. [Medline]. [Full Text]. Boyev LR, Miller NR, Green WR. Efficacy of unilateral versus bilateral temporal artery biopsies for the diagnosis of giant cell arteritis. Am J Ophthalmol. 1999 Aug. 128(2):211-5. [Medline]. Danesh-Meyer HV, Savino PJ, Eagle RC Jr, Kubis KC, Sergott RC. Low diagnostic yield with second biopsies in suspected giant cell arteritis. J Neuroophthalmol. 2000 Sep. 20(3):213-5. [Medline]. Hall JK, Volpe NJ, Galetta SL, Liu GT, Syed NA, Balcer LJ. The role of unilateral temporal artery biopsy. Ophthalmology. 2003 Mar. 110(3):543-8; discussion 548. [Medline]. Pless M, Rizzo JF 3rd, Lamkin JC, Lessell S. Concordance of bilateral temporal artery biopsy in giant cell arteritis. J Neuroophthalmol. 2000 Sep. 20(3):216-8. [Medline]. Riordan-Eva P, Landau K, O'Day J. Temporal artery biopsy in the management of giant cell arteritis with neuro-ophthalmic complications. Br J Ophthalmol. 2001 Oct. 85(10):1248-51. [Medline]. [Full Text]. Armstrong AT, Tyler WB, Wood GC, Harrington TM. Clinical importance of the presence of giant cells in temporal arteritis. J Clin Pathol. 2008 May. 61(5):669-71. [Medline]. Marí B, Monteagudo M, Bustamante E, Pérez J, Casanovas A, Jordana R, et al. Analysis of temporal artery biopsies in an 18-year period at a community hospital. Eur J Intern Med. 2009 Sep. 20(5):533-6. [Medline]. de Boysson H, Boutemy J, Creveuil C, Ollivier Y, Letellier P, Pagnoux C, et al. Is there a place for cyclophosphamide in the treatment of giant-cell arteritis? A case series and systematic review. Semin Arthritis Rheum. 2013 Aug. 43(1):105-12. [Medline]. Wolff K et al. Fig 243-4. Fitzpatrick’s Dermatology In General Medicine. 7th. 2008. 2291. Murchison AP, Bilyk JR, Eagle RC, et al. Shrinkage Revisited: How Long Is Long Enough?. Ophth Plas & Reconstructive Surg. May 2012 21;epub ahead of print. Reinhard M, Schmidt D, Schumacher M, Hetzel A. Involvement of the vertebral arteries in giant cell arteritis mimicking vertebral dissection. J Neurol. 2003 Aug. 250(8):1006-9. [Medline]. De Miguel E, Roxo A, Castillo C, Peiteado D, Villalba A, Martín-Mola E. The utility and sensitivity of colour Doppler ultrasound in monitoring changes in giant cell arteritis. Clin Exp Rheumatol. 2012 Jan-Feb. 30(1 Suppl 70):S34-8. [Medline]. Calabrese LH. Clinical management issues in vasculitis. Angiographically defined angiitis of the central nervous system: diagnostic and therapeutic dilemmas. Clin Exp Rheumatol. 2003 Nov-Dec. 21(6 Suppl 32):S127-30. [Medline]. Warrington KJ, Matteson EL. Management guidelines and outcome measures in giant cell arteritis (GCA). Clin Exp Rheumatol. 2007 Nov-Dec. 25(6 Suppl 47):137-41. [Medline]. Salvarani C, Giannini C, Miller DV, Hunder G. Giant cell arteritis: Involvement of intracranial arteries. Arthritis Rheum. 2006 Dec 15. 55(6):985-9. [Medline]. Weyand CM, Fulbright JW, Hunder GG, Evans JM, Goronzy JJ. Treatment of giant cell arteritis: interleukin-6 as a biologic marker of disease activity. Arthritis Rheum. 2000 May. 43(5):1041-8. [Medline]. Buttgereit F, Dejaco C, Matteson EL, Dasgupta B. Polymyalgia Rheumatica and Giant Cell Arteritis: A Systematic Review. JAMA. 2016 Jun 14. 315 (22):2442-58. [Medline]. Matteson EL, Buttgereit F, Dejaco C, Dasgupta B. Glucocorticoids for Management of Polymyalgia Rheumatica and Giant Cell Arteritis. Rheum Dis Clin North Am. 2016 Feb. 42 (1):75-90, viii. [Medline]. Fraser JA, Weyand CM, Newman NJ, Biousse V. The treatment of giant cell arteritis. Rev Neurol Dis. 2008 Summer. 5(3):140-52. [Medline]. [Full Text]. Mazlumzadeh M, Hunder GG, Easley KA, Calamia KT, Matteson EL, Griffing WL, et al. Treatment of giant cell arteritis using induction therapy with high-dose glucocorticoids: a double-blind, placebo-controlled, randomized prospective clinical trial. Arthritis Rheum. 2006 Oct. 54(10):3310-8. [Medline]. Prieto-González S, García-Martínez A, Arguis P, Cid MC. Early improvement of radiological signs of large-vessel inflammation in giant cell arteritis upon glucocorticoid treatment. Rheumatology (Oxford). 2013 Jul. 52(7):1335-6. [Medline]. Chan CC, Paine M, O'day J. Predictors of recurrent ischemic optic neuropathy in giant cell arteritis. J Neuroophthalmol. 2005 Mar. 25(1):14-7. [Medline]. Durand M, Thomas SL. Incidence of infections in patients with giant cell arteritis: a cohort study. Arthritis Care Res (Hoboken). 2012 Apr. 64(4):581-8. [Medline]. Villiger PM, Adler S, Kuchen S, Wermelinger F, Dan D, Fiege V, et al. Tocilizumab for induction and maintenance of remission in giant cell arteritis: a phase 2, randomised, double-blind, placebo-controlled trial. Lancet. 2016 May 7. 387 (10031):1921-7. [Medline]. Stone JH, Tuckwell K, Dimonaco S, Klearman M, Aringer M, Blockmans D, et al. Efficacy and Safety of Tocilizumab in Patients with Giant Cell Arteritis: Primary and Secondary Outcomes from a Phase 3, Randomized, Double-Blind, Placebo-Controlled Trial [abstract]. Arthritis Rheumatol. 2016. 68(suppl 10):[Full Text]. FDA approves first drug to specifically treat giant cell arteritis. U.S. Food & Drug Administration. Available at https://www.fda.gov/NewsEvents/Newsroom/PressAnnouncements/ucm559791.htm. May 22, 2017; Accessed: May 23, 2017. Loricera J, Blanco R, Hernández JL, Castañeda S, Mera A, et al. Tocilizumab in giant cell arteritis: Multicenter open-label study of 22 patients. Semin Arthritis Rheum. 2015 Jun. 44 (6):717-23. [Medline]. Hoffman GS, Cid MC, Rendt-Zagar KE, Merkel PA, Weyand CM, Stone JH, et al. Infliximab for maintenance of glucocorticosteroid-induced remission of giant cell arteritis: a randomized trial. Ann Intern Med. 2007 May 1. 146(9):621-30. [Medline]. Martínez-Taboada VM, Rodríguez-Valverde V, Carreño L, López-Longo J, Figueroa M, Belzunegui J, et al. A double-blind placebo controlled trial of etanercept in patients with giant cell arteritis and corticosteroid side effects. Ann Rheum Dis. 2008 May. 67(5):625-30. [Medline]. Ly KH, Dalmay F, Gondran G, Palat S, Bezanahary H, Cypierre A, et al. Steroid-sparing effect and toxicity of dapsone treatment in giant cell arteritis: A single-center, retrospective study of 70 patients. Medicine (Baltimore). 2016 Oct. 95 (42):e4974. [Medline]. De Silva M, Hazleman BL. Azathioprine in giant cell arteritis/polymyalgia rheumatica: a double-blind study. Ann Rheum Dis. 1986 Feb. 45(2):136-8. [Medline]. [Full Text]. Taylor-Gjevre R, Vo M, Shukla D, Resch L. Temporal artery biopsy for giant cell arteritis. J Rheumatol. 2005 Jul. 32(7):1279-82. [Medline]. Mahr AD, Jover JA, Spiera RF, Hernández-García C, Fernández-Gutiérrez B, Lavalley MP, et al. Adjunctive methotrexate for treatment of giant cell arteritis: an individual patient data meta-analysis. Arthritis Rheum. 2007 Aug. 56(8):2789-97. [Medline]. Hoffman GS, Cid MC, Hellmann DB, Guillevin L, Stone JH, Schousboe J, et al. A multicenter, randomized, double-blind, placebo-controlled trial of adjuvant methotrexate treatment for giant cell arteritis. Arthritis Rheum. 2002 May. 46(5):1309-18. [Medline]. Caporali R, Cimmino MA, Ferraccioli G, Gerli R, Klersy C, Salvarani C, et al. Prednisone plus methotrexate for polymyalgia rheumatica: a randomized, double-blind, placebo-controlled trial. Ann Intern Med. 2004 Oct 5. 141(7):493-500. [Medline]. Grossman JM, Gordon R, Ranganath VK, Deal C, Caplan L, Chen W, et al. American College of Rheumatology 2010 recommendations for the prevention and treatment of glucocorticoid-induced osteoporosis. Arthritis Care Res (Hoboken). 2010 Nov. 62(11):1515-26. [Medline]. Guslandi M. Steroid ulcers: Any news?. World J Gastrointest Pharmacol Ther. 2013 Aug 6. 4(3):39-40. [Medline]. [Full Text]. Nesher G, Berkun Y, Mates M, Baras M, Rubinow A, Sonnenblick M. Low-dose aspirin and prevention of cranial ischemic complications in giant cell arteritis. Arthritis Rheum. 2004 Apr. 50(4):1332-7. [Medline]. Jennette JC, Falk RJ, Bacon PA, Basu N, Cid MC, et al. 2012 revised International Chapel Hill Consensus Conference Nomenclature of Vasculitides. Arthritis Rheum. 2013 Jan. 65 (1):1-11. [Medline]. [Full Text]. Samson M, Corbera-Bellalta M, Audia S, Planas-Rigol E, Martin L, Cid MC, et al. Recent advances in our understanding of giant cell arteritis pathogenesis. Autoimmun Rev. 2017 May 28. [Medline]. Kuo CH, McCluskey P, Fraser CL. Chewing Gum Test for Jaw Claudication in Giant-Cell Arteritis. N Engl J Med. 2016 May 5. 374 (18):1794-5. [Medline]. [Full Text]. Bhatti MT, Frohman L, Nesher G. MD Roundtable: Diagnosing Giant Cell Arteritis. EyeNet. 2017 June. 21(6):31-34. WAGENER HP, HOLLENHORST RW. The ocular lesions of temporal arteritis. Am J Ophthalmol. 1958 May. 45 (5):617-30. [Medline]. Murchison AP, Gilbert ME, Bilyk JR, Eagle RC Jr, Pueyo V, Sergott RC, et al. Validity of the American College of Rheumatology criteria for the diagnosis of giant cell arteritis. Am J Ophthalmol. 2012 Oct. 154 (4):722-9. [Medline]. Rhéaume M, Rebello R, Pagnoux C, Carette S, Clements-Baker M, Cohen-Hallaleh V, et al. High-resolution Magnetic Resonance Imaging of scalp arteries for the diagnosis of giant cell arteritis: Results of a prospective cohort study. Arthritis Rheumatol. 2016 Aug 2. [Medline]. Nielsen BD, Hansen IT, Kramer S, Haraldsen A, Hjorthaug K, Bogsrud TV, et al. Simple dichotomous assessment of cranial artery inflammation by conventional 18F-FDG PET/CT shows high accuracy for the diagnosis of giant cell arteritis: a case-control study. Eur J Nucl Med Mol Imaging. 2018 Jul 31. [Medline]. Luqmani R, Lee E, Singh S, Gillett M, Schmidt WA, Bradburn M, et al. The Role of Ultrasound Compared to Biopsy of Temporal Arteries in the Diagnosis and Treatment of Giant Cell Arteritis (TABUL): a diagnostic accuracy and cost-effectiveness study. Health Technol Assess. 2016 Nov. 20 (90):1-238. [Medline]. [Full Text]. Duftner C, Dejaco C, Sepriano A, Falzon L, Schmidt WA, Ramiro S. Imaging in diagnosis, outcome prediction and monitoring of large vessel vasculitis: a systematic literature review and meta-analysis informing the EULAR recommendations. RMD Open. 2018. 4 (1):e000612. [Medline]. [Full Text]. [Guideline] Dejaco C, Ramiro S, Duftner C, Besson FL, Bley TA, Blockmans D, et al. EULAR recommendations for the use of imaging in large vessel vasculitis in clinical practice. Ann Rheum Dis. 2018 May. 77 (5):636-643. [Medline]. [Full Text]. Schäfer VS, Chrysidis S, Dejaco C, Duftner C, Iagnocco A, et al. Assessing Vasculitis in Giant Cell Arteritis by Ultrasound: Results of OMERACT Patient-based Reliability Exercises. J Rheumatol. 2018 Jul 1. [Medline]. Lumbar angiogram showing stenosis and occlusion of femoral artery branches due to vasculitis. Hematoxylin- and eosin-stained femoral artery branch, cross section, taken from a lower limb amputation specimen. Mononuclear cell invasion and necrosis in the media of this large artery can be observed. Extensive lower limb vasculitis from GCA resulted in ischemic necrosis of the lower limb, necessitating amputation. Hematoxylin and eosin stain, low power. Temporal artery. Note the thrombosis in the lumen, intimal hyperplasia, and infiltration of the arterial wall muscular layers with inflammatory cells. A multinucleated giant cell is seen internal to the muscularis at the area of the internal elastic lamina (upper right). Anterior ischemic optic neuropathy. Image courtesy of Richard Kho, MD, Q.C. Eye Center, Quezon City, Philippines. Branch retinal vein occlusion in a patient with giant cell arteritis. Image courtesy of Manolette Roque, MD, Roque Eye Clinic, Manila, Philippines. Central retinal artery occlusion (CRAO). Prominent temporal artery is visible on the temple of a 76-year-old woman with temporal arteritis. Courtesy of ScienceSource (https://www.sciencesource.com/).